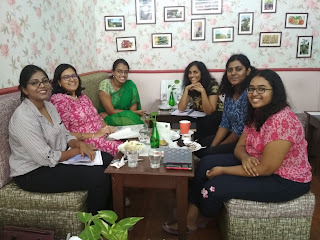 The third session of the Feminifesto Seminar Club had the group listening to the presentation by Chennai Centre for China Studies (C3S) Research Officer, Anuja Gurele on her recent publication the C3S Issue Map Politics&Feminism in China – Will Women Hold Up Half the Sky? 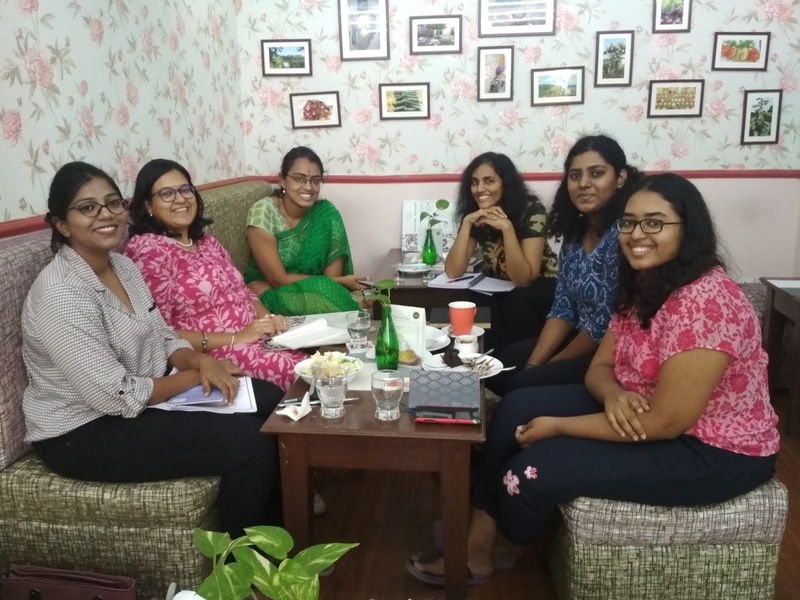 Anuja who completed her MA in Politics and International Relations from Central University of Gujarat, Gandhinagar and has a Bachelors’ in Journalism and Mass Communication from Jagran Lakecity University, Bhopal gave us a lot of information to chew on. Some stark figures included the following: the top decision making body of the Chinese Communist Party – the seven-member Standing Committee of the Polit Bureau has never had a woman member. In the 25 strong Polit Bureau, the number of women to date have never exceeded two, and the present bureau has only one woman. The National People’s Congress only has 33 women –that’s about 9%. The evolution of the once matriarchal Chinese cultureinto the male-dominated government it is now was brought out. Perhaps greatly influenced by Confucianism of the Han court that has persisted through empires and revolutions and communism. This is especially worrying when Confucian centres are being promoted as Chinese cultural centres across the globe. As recently as 2017, there were etiquette classes for Chinese women in Confucian centres that indoctrinate them to be gentle and obedient wives. It was interesting to learn that women in the Tang dynasty were encouraged to study, while the practice of food binding began in the Chin dynasty as a response to invasion and as a matter of showing racial superiority. But for us all learning about the reign of the only Empress of China Wu Zeitan was most interesting. Vaishnavi Pallapothu later shared an excerpt about the Empress from the graphic novel Brazen: Rebel Ladies Who Rocked the World by Pénélope Bagieu. Listening to the presentation I was reminded of the discussion between the actor Emma Thompson and author Mary Beard on BBC, on the plight of women in the West. The glass ceilings, toxic work, street and home environments and the societal pressure to conform to outdated gender roles. East or West the pressures on women continue. Even Scandinavia which pioneered this feminist foreign policy and has better gender equality indicators than the rest of the world has a different kind of peer pressure that emphasises contributions to the economy by working. As we discussed in a previous session the value you have is your direct contribution to the economy, period. The programme ends with Emma and Mary visiting the grave of Mary Wollstonecraft who is buried with the words Author of A Vindication of the Rights of Woman, instead of the usual ‘beloved mother, daughter, wife’! A fitting response to an age when women hid their authorship and non-traditional talents. A note left on the gravestone called out male geniuses and philosophers across ages who kept women from attaining their full potential with their advice about being the ideal woman. Chinese systemic acts and labels that kept women from power were discussed, such as leftover women – unmarried women in their 30s; referring to women with multiple degrees as the ‘third gender’, the Chinese version of the Old Boys Network – Guanxi (defined by Wikipedia as the rudimentary dynamic in personalized social networks of power [which can be best described as the relationships individuals cultivate with other individuals] and is a crucial system of beliefs in Chinese culture) which helped keep women off the top echelons of politics and power in China over the ages. Similarly the idea of the ‘Socialist Housewife’ – who didn’t compete with men for jobs and served her husband who worked for the nation as a means of serving the country was a concept promulgated in the mid twentieth-century as a pushback as women joined the workforce in greater numbers competing with men for work. The arrest of the Feminist Five in China who stuck posters to bring attention to sexual harassment in public transport ahead of International Women’s Day 2015 and their subsequent release due to international outrage and pressure was also delved into. Kirthi Jayakumar highlighted this restriction to personal agency in China. Anuja in turn emphasised the insidious misogyny in Confucianism and the even more worrying the constitutionally embedded gender inequality in China. The Feminist Five defied the Party to highlight the plight of women with the Blood Bride march in 2012 and many such publicity stunts that garnered attention to their cause. Although the matrilineal Mosuo tribe, a small ethnic group living around China's Lugu Lake in the provinces of Sichuan and Yunnan, who trace their lineage through the female side of the family are held up by as example of cultural tolerance and inclusion in China and the status of women. Kirthi and Anuja discussed how this community was reduced to a tourist attraction – a poster child of Chinese diversity and inclusion – unlike the hidden Muslim detention camps. Kirthi questioned the reluctance of the international community to apply pressure on China. Why was the international community afraid to confront China. China squashes all international questioning – blacklisting, money power and of course the all-powerful UN veto whenever topics whenever its actions are questioned – e.g., nobody talks about Taiwan, Tiananmen and Tibet if they want to continue to benefit from associations with the Chinese Government. Later a comparison to reasons why bystanders don’t intervene in case of violence was made to this reluctance to confront China on its doublespeak. Beijing in 1995 was the host of the 4th UN Conference on Women yet the promises made then didn’t translate into national policy. It was here that US First Lady Hilary Clinton made her iconic “Women’s Rights are Human Rights” speech. Yashasvini Rajeshwar and Malavika Mani in turn discussed how in China any feminist movement was squashed with nationalistic fervour as feminism was equated to western capitalism and instead there were calls for an oriental, Asian-origin feminism with no room for any Western capitalistic ideas. Yashasvini linked the practical reality of the status of women in China – so starkly different from propaganda to the finding of Korean American journalist Suki Kim who went undercover in North Korea and emphasized the fact at The Hindu Lit for Life festival panel discussion that the media and internet blackout “creates a perception on peace in Korean peninsula. But a lot of talks and photo-ops have happened. In reality, North Korea has not given up nuclear weapons." Yet, despite the constant surveillance and censorship, the tech savvy young people in China have succeeded in subverting the social media and harnessing it for their purposes, e.g., the image of the Rice Bowl in Chinese social media to show the solidarity to the #MeToo movement, secret meeting to discuss feminist principles and even art advocacy to address the gender imbalance. A discussion on whether there were certain professions and career paths not open to women in China, it was brought out that there were rarely women crew on Chinese funded international infrastructure projects or even in the mechanical jobs and space exploration. Querying the possible Chinese government and diplomatic treatment of foreign women activists when within Chinese borders the intersection of race and women’s rights became apparent. White women activists and professional are treated differently from African, Asian and South Asian women. Overall, despite Mao’s famed line about ‘women holding up half the sky’, government surveillance means people don’t speak about gender equality and feminism in China. But they speak up abroad! Despite regressive attitudes to women seeking power within China, some Chinese officials, businesspeople and academics emphasize instead the poor status of women and limited opportunities offered to women in other countries. Interesting insights all around.